We are currently hiring below Positions. 1: Candidates from Facilities Management Industry preferred. 2: Technicians must have Diploma/IT with 2 years or 5 Years of Gulf Experience in Facilities Management Industry. 3: Engineers and Supervisors must have Bachelors in Engineering with Valid UAE Driving License. 4: English Communication is must for all positions except helpers. 5: Candidates who can join immediately preferred. 6: Candidates on visit visa can apply for all positions. Salary: Depends upon Position and Experience, Salary will be final at Interview Table. Contact: All candidates require to visit us at below address for walk in Interview. 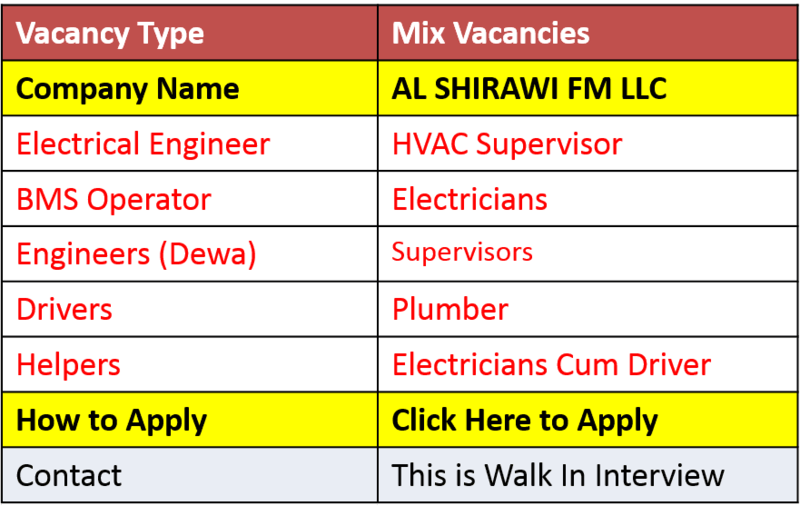 Al Shirawi Office, Ras Al Khor, Industrial Area 2, Street No 8A, Near Al Abbar Glass Factory Behind Leader Metal, Dubai UAE. Please SUPPORT US, Sharing our posts boost our Energy. Like us on Facebook, Send Invitations to your friends to Like our Page. Employees visa sir my name Amar Singh. My no.0562602128. Recently cancelled my visa by company because terminated 10th july with One month notice ,But I am interested to work UAE .how I can collect necessary document to safe me from fine ? Same time any help can I aspect from Government work as a class Marine engineer?